Oh, as you can tell, I've fallen hard for mid-30s fashion. I'll always have a spot in my heart for late 30s/early 40s wartime style, but I think I've found my vintage niche. 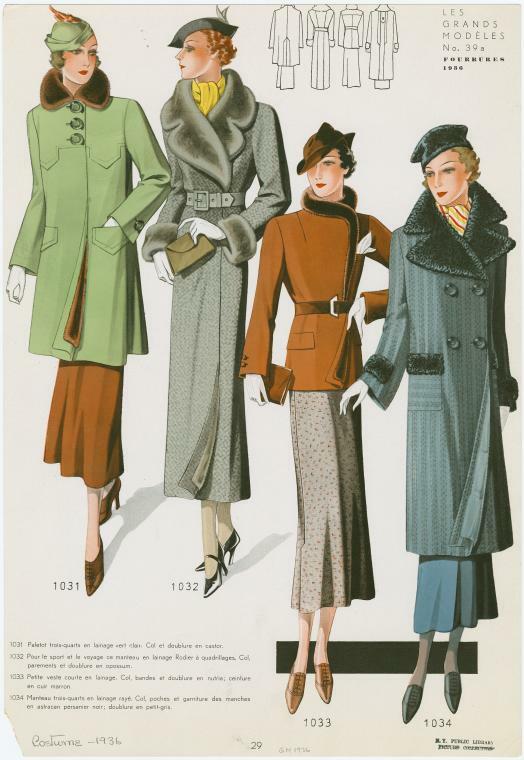 I'll take one of each of these delicious coats, please, Santa! You'll hate me, but I have the one on the left, well a very similar one in a gray tweed with a light brown fur collar. It was given to me by my Nana and I adore it. I think hers dates more to the early 40s, but it is the same silhouette and detailing. I love the two middle ones as well, so slinky and sophisticated. Knitosaurusrex: ooh, wonderful! Even better that it has personal history! Darla, I know what you mean!!!! Oh yes, must have them all!!! I love the 20's and 30's but my curves don't suit it... 40's and 50's suit me best. I love them all as well but I love the green one the best! !